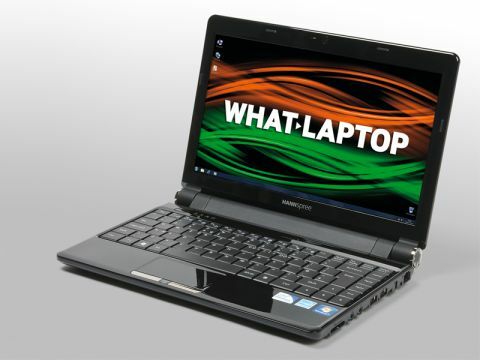 Although best known globally for its LCD televisions, Hannspree has also put out a small number of consumer laptops. The Hannspree SN12-E22B is an ultraportable machine that offers suitably powerful performance and mobility, with only minor usability issues detracting from its appealing demeanour. Portability is undoubtedly one of the strongest draws, with a weight of just 1.6kg and a slim chassis that fits into bags and cases with ease. This is backed up by an impressive 376 minutes of battery life, so you won't need to hunt down plug sockets when working on the move. Despite its small stature, there's a low-voltage Intel Core 2 Duo processor running the show, backed up by 2048MB of speedy DDR3 memory. The resultant performance is twice as fast as most netbooks, which is more than enough for light multi-tasking or running office applications. However, the integrated graphics card is inevitably only powerful enough for basic multimedia tasks, such as editing your family photos. Build quality is mixed. An attractive glossy finish has been employed throughout, but the interior attracts dust and fingerprints and the palmrest flexes under pressure, although nothing serious. Sadly, the keyboard also flexes in the middle, resulting in a spongy feel when typing. Another minor gripe is that some of the key markings are a little cluttered with alternative characters, which may prove confusing, although the keyboard does at least stretch the width of the chassis, so keys are a decent size. The touchpad is marked by a dip in the chassis and can be turned off if necessary, but the mouse buttons are thin and recessed and can be awkward to press at times. Unsurprisingly for a company renowned for its televisions, Hannspree has included an excellent 12-inch screen. The 1366 x 768-pixel resolution results in sharp images. Brightness and contrast levels are also highly impressive, so browsing your photo albums or watching movies is always a pleasure. Networking is fast thanks to the inclusion of 802.11n Wi-Fi and Gigabit Ethernet for high-speed wireless and wired connections. A 3-in-1 memory card reader and three USB ports are built in, and HDMI connectivity is available for outputting to a high-definition (HD) external display. The 250GB hard drive provides ample storage for all your files and applications, but there's no optical drive. The Hannspree SN12-E22B displays the portability of a netbook, but with twice the power and a highly impressive screen thrown into the mix as well. However, usability is slightly flawed so you should aim to try before you buy.